On the afternoon of October 27, approximately 150 guests reveled in the success of Buffalo State’s Transforming Lives campaign during a closing ceremony in the Campbell Student Union Social Hall. The celebration included a video montage capturing the spirit of the campaign, reflections from the campaign’s leaders, and performances by the college’s S.P.I.R.I.T. Gospel Choir and the Digital Music Ensemble. There was much to celebrate. Transforming Lives: A Campaign for Buffalo State, which began in 2011 and culminated in June 2015, raised $27.3 million and exceeded the original goal by $7 million. 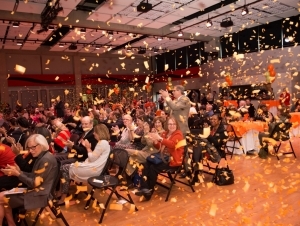 In her remarks, Buffalo State President Katherine Conway-Turner reflected on the beginning of the campaign in which then President Aaron Podolefsky and Susanne Bair, vice president for institutional advancement, asked the campus community, its alumni, and friends to “dream about what a campaign can do for this campus. Campaign gifts included funding for 30 new endowed scholarships, eight non-endowed scholarships; an endowed faculty chair in Exceptional Education; two art conservation program fellowships, the creation of the Louis P. Ciminelli Recital Hall; the upcoming Jacqueline V. LoRusso Alumni House/Visitor’s Center; Statler study abroad scholarships; the new Ferguson Planetarium; the E.O. Smith Arts and Humanities Faculty Development Fund; and the Jim Grunebaum Speakers Series in Philosophy Fund. Bair recognized the dedication of campaign co-chairs, Brandys and Linda Dobmeier, ’71, along with members of the president’s cabinet, members of the campaign steering committee, and the Institutional Advancement staff “who went above and beyond to ensure the campaign’s success. Matthew Dispenza, a first-year Spanish major from Wilson, New York, told the crowd how being a recipient of three scholarships made a tremendous difference in his life. Dobmeier noted what the success of Transforming Lives says about Buffalo State.